Delirium is common in palliative care. It effects up to 88% of patients with advanced cancer at end of life and has a point prevalence of 20% in the acute hospital setting across all diagnoses. It is under diagnosed and not optimally treated. “Months of the Year Backwards” (MOTYB) is an ideal screening tool for delirium with a sensitivity of 83.8%. It is brief to perform and carries low burden for patients. The aim of this study is to investigate the use of MOTYB as a screening tool for delirium in palliative care patients in the acute hospital setting. All patients who were referred to the hospital palliative care team in September 2016 were screened. Forty five patients were screened using MOTYB. Fifteen patients (33%) screened positive for delirium. MOTYB is a simple screening tool that was easily integrated into practice in a hospital service. It has the potential to identify missed cases of delirium and therefore improve management and ultimately patient outcomes. Delirium is common in patients receiving specialist palliative care (SPC) and effects up to 88% of patients with advanced cancer in the last weeks of life (1). The point prevalence of delirium in the acute hospital setting across all diagnoses has been reported in Ireland as 20%8. Despite the frequency of delirium, it remains under diagnosed and is therefore not optimally treated. It is vital to detect delirium as it has been demonstrated to be reversible in 49% of patients with advanced cancer (2). Delirium is associated with increased risk of death in elderly patients (3) and is an independent risk factor for mortality (4). The duration of delirium is also of significance as mortality risk increases by 11 % for every 48 hours of delirium (5). It is associated with psychological morbidity for both patients and families. Patients describe distressing imagery of seeing deceased relatives, feeling trapped and being stuck in “a borderland between external reality and the imagination” and a “turmoil of past and present” (6). The traditional treatment of delirium in patients receiving palliative care with antipsychotic medications has been challenged (7). Despite its prevalence, delirium is under diagnosed and frequently not identified when present in the clinical setting. Ryan et al reported 64% of patients with delirium were recognised as confused by nursing staff while only 44% had confusion documented by medics (8). 76 % of cases of delirium were missed by Emergency Physicians on admission to hospital (9). Use of the term delirium in clinical notes has been associated with improved management plans in hospital based patients receiving SPC (10). Previous studies recommend the implementation of delirium screening to reduce missed diagnoses and improve management (1) (10). NICE guidelines recommend daily screening for those patients most at risk of developing delirium (11). Screening tools can be time consuming and burdensome for both patients and clinicians making it difficult to easily incorporate into daily clinical practice. An ideal screening tool would have high sensitivity, be brief and easily integrated into clinical practice and not be of burden to patients. The Confusion Assessment Method has been validated in the SPC setting in hospice inpatients (12) but no screening tool has been validated for inpatients receiving SPC in hospital. O’Regan et al reported that MOTYB alone was the most accurate single screening test for delirium in patients in the acute hospital setting with sensitivity of 83.3% and specificity of almost 90%. This sensitivity increased to 83.8% for patients over 65 years. (13). This test typically takes 1-2 min, with cognitively intact patients usually completing the test within 20 seconds (14). Inattention is a core feature of delirium. The months of the year backwards (MOTYB)test, also referred to as the months backwards test (MBT)or the months of the year in reverse order (MOYR) has been described as primarily a test of attention, but also assesses concentration, executive function, cognitive flexibility and central processing speed (15). The MOTYB has particular utility in screening for delirium in hospital inpatients (13) (8) (16) but is not a diagnostic tool. The most notable advantages of using this test are the short duration of administration and requirement of minimal resources making it readily usable in clinical settings (15). A further advantage of MOTYB is that it is applicable to patients of all levels of educational attainment and cognitive ability. Other screening tools have been validated in the palliative care setting. The Confusion Assessment Method has been validated in the specialist palliative care unit but requires user training (12). The aim of this study was to investigate the feasibility and usefulness of MOTYB as a screening tool for delirium in palliative care patients in the acute hospital setting. All patients who were referred to an acute hospital SPC team in September 2016 were screened on one occasion with MOTYB. They were deemed to screen positive for delirium if they were unable to list the months of the year backwards from December to July. The clinician recorded if there was an obvious reason why it was not possible to perform the test. The clinician was also asked if they were surprised by the result of the screening tool and to comment on the use of this test in daily practice. Data was recorded using Microsoft excel. Fifty eight patients were referred in this period. Six clinicians used the tool during this period. One specialist registrar and one registrar in palliative medicine, two house officers doing a rotation in palliative medicine while undergoing general practice training and two clinical nurse specialists in palliative care. It was not possible to perform screening on thirteen patients as ten were unresponsive at the time of referral and three patients had a language barrier. Forty five patients were screened using MOTYB. Patient demographics and primary medical condition leading to referral to the SPC team are outlined in tables 1 and 2. 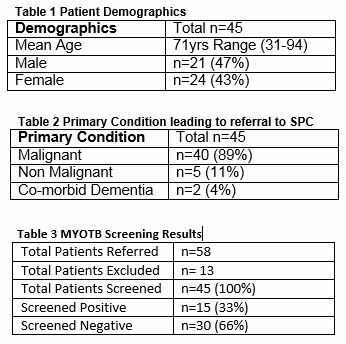 Fifteen patients (33%) screened positive for delirium (Table 3). In eleven cases (24%) the clinician was surprised by the result. Clinicians commented that the tool was “easy to remember” “did not bother the patients” and “only took a minute”. This study demonstrates that MOTYB was easily integrated into the routine clinical practice of an SPC team in the acute hospital setting. It is a tool that carries low burden to patients and clinicians and has the potential to detect cases of delirium that could otherwise be missed. The clinician was surprised by the result in almost one quarter of cases, suggesting that in these patients delirium was not considered prior to screening. This enhances the argument for routine screening to detect cases which would not have been identified without screening. Although a diagnostic tool is required to confirm delirium diagnoses, this study suggests a higher prevalence of delirium in the acute hospital patients receiving SPC than the general acute hospital population. This is not surprising given the prevalence among patients with advanced cancer. However it does further affirm the importance of screening this population. One of the concerns about screening for delirium is poor specificity in the presence of dementia. Of the forty five patients included in this study only two had a documented diagnosis of dementia. SPC teams are multidisciplinary and incorporate staff of varying degrees of experience in the specialty. The use of this tool by both nursing and medical staff suggest that it can easily be used by many multidisciplinary team members with simple instructions on its use. Limitations of this study exist. Our findings are based on a limited sample size. In order to formally validate this tool in this setting diagnostic testing would be required to calculate the sensitivity and specificity. There are some identified limitations of MOTYB. In particular no clear instruction on how to manage patient error in performing the test. It is important to highlight that MOTYB is not intended as a diagnostic or grading tool for delirium. MOTYB is a simple screening tool that was easily integrated into routine practice in an acute hospital specialist palliative care service. This study demonstrates that it was integrated into practice without significant burden to the clinicians and is therefore likely to be regularly used. It has the potential to identify missed cases of delirium, improve management and ultimately patient outcomes. Further research is required to validate its use in this population. The authors have no conflict of interest in relation to the subject matter in this manuscript. 1. Hosie A, Davidson PM, Agar M, Sanderson CR, Phillips J. Delirium prevalence, incidence, and implications for screening in specialist palliative care inpatient settings: a systematic review. Palliative medicine. 2013;27(6):486-98. 2. Lawlor PG, Gagnon B, Mancini IL, Pereira JL, Hanson J, Suarez-Almazor ME, Bruera ED Occurrence, causes, and outcome of delirium in patients with advanced cancer: a prospective study. Archives of internal medicine. 2000;160(6):786-94. 3. Witlox J, Eurelings LS, de Jonghe JF, Kalisvaart KJ, Eikelenboom P, van Gool WA. Delirium in elderly patients and the risk of postdischarge mortality, institutionalization, and dementia: a meta-analysis. Jama. 2010;304(4):443-51. 4. Caraceni A, Nanni O, Maltoni M, Piva L, Indelli M, Arnoldi E, Monti M, Montanari L, Amadori D, De Conno F. Impact of delirium on the short term prognosis of advanced cancer patients. Italian Multicenter Study Group on Palliative Care. Cancer. 2000;89(5):1145-9. 5. Gonzalez M, Martinez G, Calderon J, Villarroel L, Yuri F, Rojas C, Jeria A,Valdivia G,Marin PP, Carrasco M. Impact of delirium on short-term mortality in elderly inpatients: a prospective cohort study. Psychosomatics. 2009;50(3):234-8. 6. O'Malley G, Leonard M, Meagher D, O'Keeffe ST. The delirium experience: a review. Journal of psychosomatic research. 2008;65(3):223-8. 7. Agar MR, Lawlor PG, Quinn S, Draper B, Caplan GA, Rowett D, Sanderson C, Hardy J, Le B, Eckermann S, McCaffery N, Devilee L, Fazekas B, Hill M, Currow DC. Efficacy of Oral Risperidone, Haloperidol, or Placebo for Symptoms of Delirium Among Patients in Palliative Care: A Randomized Clinical Trial. JAMA internal medicine. 2017;177(1):34-42. 8. Ryan DJ, O'Regan NA, Caoimh RO, Clare J, O'Connor M, Leonard M, Mcfarland J, Tighe S, O'Sullivan K, Trzepacz PT, Meagher D, Timmons S. Delirium in an adult acute hospital population: predictors, prevalence and detection. BMJ open. 2013;3(1). 9. Han JH, Zimmerman EE, Cutler N, Schnelle J, Morandi A, Dittus RS, Storrow AB, Ely EW. Delirium in older emergency department patients: recognition, risk factors, and psychomotor subtypes. Academic emergency medicine : official journal of the Society for Academic Emergency Medicine. 2009;16(3):193-200. 10. Hey J, Hosker C, Ward J, Kite S, Speechley H. Delirium in palliative care: Detection, documentation and management in three settings. Palliative & supportive care. 2015;13(6):1541-5. 11. Young J, Murthy L, Westby M, Akunne A, O'Mahony R. Diagnosis, prevention, and management of delirium: summary of NICE guidance. BMJ (Clinical research ed). 2010;341:c3704. 12. Ryan K, Leonard M, Guerin S, Donnelly S, Conroy M, Meagher D. Validation of the confusion assessment method in the palliative care setting. Palliative medicine. 2009;23(1):40-5. 13. O'Regan NA, Ryan DJ, Boland E, Connolly W, McGlade C, Leonard M, Clare J, Eustace JA, Meagher D, Timmons S. Attention! A good bedside test for delirium? Journal of neurology, neurosurgery, and psychiatry. 2014;85(10):1122-31. 14. Ostberg P, Hansson V, Haagg S. Adult norms and test-retest reliability for the Months Backward test: durational and response accuracy measures. Logopedics, phoniatrics, vocology. 2012;37(1):11-7. 15. Meagher J, Leonard M, Donoghue L, O'Regan N, Timmons S, Exton C, Cullen W, Dune C, Adamis D, Maclullich AJ, Meagher D. Months backward test: A review of its use in clinical studies. World journal of psychiatry. 2015;5(3):305-14. 16. Bellelli G, Morandi A, Davis DH, Mazzola P, Turco R, Gentile S, Ryan T,Cash H, Guerini F, Torpilliesi T, Del Santo F, Trabucchi M, Annoni G, MacLullich AM. Validation of the 4AT, a new instrument for rapid delirium screening: a study in 234 hospitalised older people. Age and ageing. 2014;43(4):496-502.